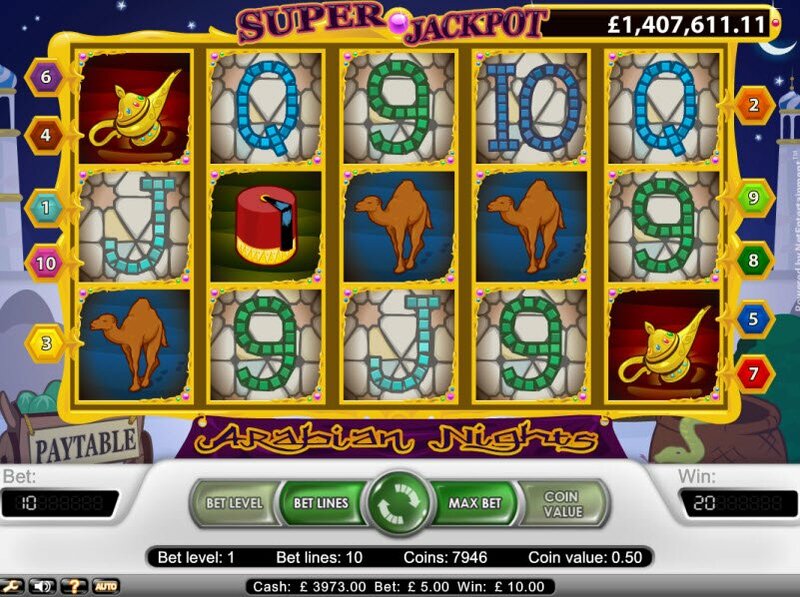 The Arabian Nights Slot Machine may not have a lot to offer in terms of appearance, however those who play have a chance of cashing in on a progressive jackpot. If you’re willing to overlook the poor quality graphics, you might just cash in big. 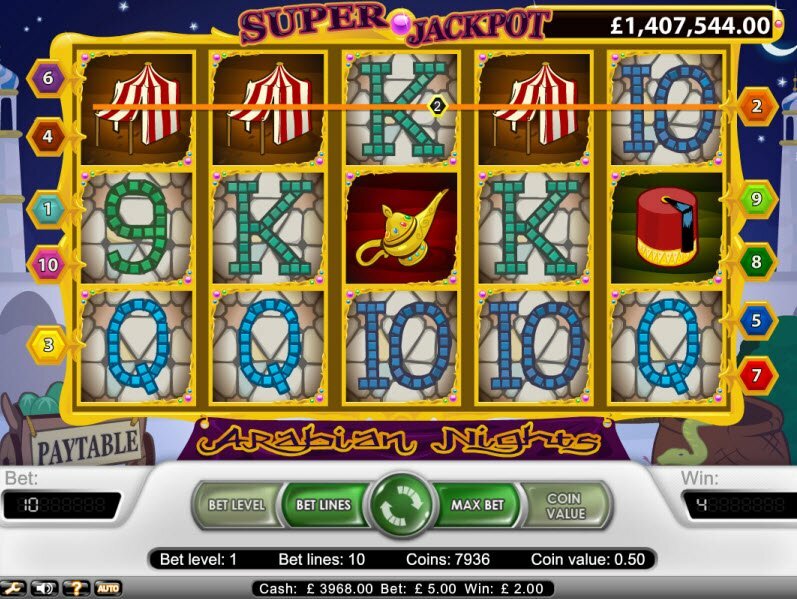 Powered by Netent, the Arabian Nights Slot Machine features 5 reels and 10 paylines. Those seeking superior game graphics should pass on this one. However, the Arabian Nights Slot Game does include a progressive jackpot that could turn a lucky player into an instant millionaire. With a name like Arabian Nights, I expected to feel whisked away on a magic carpet ride above the palaces of ancient Baghdad. 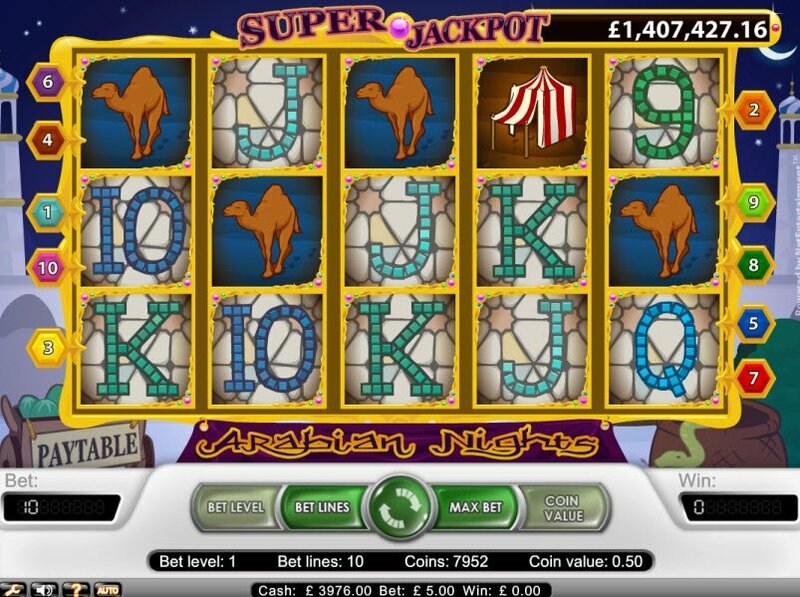 Indeed, the slot images may an attempt at creating such a romantic theme with images of a camel, fez hat, genie lamp, scimitar, mosaic letters and numbers, and desert tents. The sound effects aren’t bad and have some traditional Middle Eastern musical flavor. However, the poor quality graphics really take away from the game. Overall, the game design and animations don’t make the grade. Perhaps the best part of the Arabian Nights Slot Game is that it also includes a progressive jackpot that keeps on growing. Win this jackpot, and you could become an instant millionaire! The Arabian Nights Slot Machine only has a few features to keep the game interesting. The Genie Lamp serves as the Scatter Symbol. 3 or more Scatters award 15 Free Spins. The Sultan represents the Wild Symbol. Wins with Wild Symbols double. Perhaps the best part of the Arabian Nights Slot Game is that it also includes a progressive jackpot that keeps on growing. Win this jackpot, and you could become an instant millionaire! Can You Bet on Mybet Casino Online?